Interfood is a leading multinational specialising in industrial dairy products, such as milk powders, butter and dairy proteins. The majority of its worldwide buyers are dairy and food manufacturers. Interfood has 16 offices on all continents, each of which works with a different ERP system. To become a partner of choice for customers and remain competitive in the market, a new ERP system is being implemented in phases at all branches to support the daily business at Interfood. After the new ERP system is implemented, business processes can be coordinated worldwide in order to ensure efficiency and high quality and to keep the IT landscape up-to-date, fast and reliable. 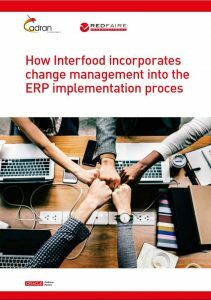 Interfood opted for Oracle’s JD Edwards ERP. Interfood chose Cadran to implement the system because they developed a special module for commodity traders. The first office to migrate to this new system is the Dutch office. Sanne van Hoeij, Change Facilitator and HR Advisor at Interfood, describes in summary the step-by-step plan that resulted in successful implementation. Interested in complete Interfood case study? Download here! Download complete Interfood case study here!